The Intelligent Scissors tool is an interesting piece of equipment: it has some features in common with the Lasso, some features in common with the Path tool, and some features all its own. It is useful when you are trying to select a region defined by strong color-changes at the edges. 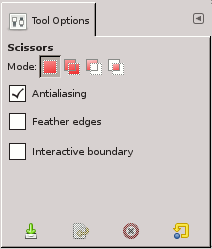 To use the Scissors, you click to create a set of "control nodes", also referred to as anchors or control points, at the edges of the region you are trying to select. The tool produces a continuous curve passing through these control nodes, following any high-contrast edges it can find. If you are lucky, the path that the tool finds will correspond to the contour you are trying to select. Unfortunately, there seem to be some problems with the edge-following logic for this tool, with the result that the selections it creates tend to be pretty crude in a lot of cases. A good way to clean them up is to switch to QuickMask mode, and use paint tools to paint in the problematic parts. On the whole, most people find the Path tool to be more useful than the Scissors, because, even though it does not have the intelligent edge-finding capability, the paths it produces persist until you delete them, and can be altered at any time. by using the keyboard shortcut I. 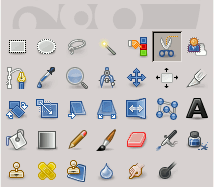 The default behavior of the Shift, Ctrl, and Alt keys is described in Paragraaf 2.1.1, “Toetsencombinaties (Standaard instellingen)” for all selection tools. 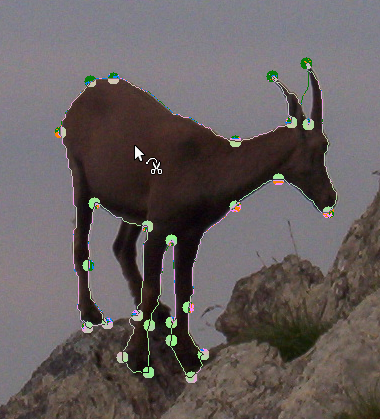 By default, the auto-edge snap feature is enabled: whenever you click and drag the mouse pointer, the Scissors tool finds the point of the maximal gradient (where the color change is maximal) for placing a new control node or moving an existing node. Holding down this key while clicking and dragging disables this feature, and the control node will be placed at the position of the mouse pointer. Each time you left-click with the mouse, you create a new control point, which is connected to the last control point by a curve that tries to follow edges in the image. To finish, click on the first point (the cursor changes to indicate when you are in the right spot). You can adjust the curve by dragging the control nodes, or by clicking to create new control nodes. When you are satisfied, click anywhere inside the curve to convert it into a selection. As said above when you click with this tool you drop points. The selection boundary is driven by these control points. During creation you can move each one by clicking and dragging, except the first and the last one. The selection is closed when you are clicking the last point over the first one. When the selection is closed the pointer shape changes according to its position: inside , on the boundary , and outside . You can adjust the selection creating new points by clicking on the boundary or by moving each control points (merged first and last point). The selection is validated when you click inside. You have to notice that you can get only one selection; if you create a second selection, the first one is erased when you validate the second one. Zie Selectie Gereedschappen voor meer informatie over eigenschappen die gelden voor alle selectie gereedschappen. Alleen opties specifiek voor het rechthoekselectie gereedschap worden hier besproken. If this option is enabled, dragging a control node during placement will indicate the path that will be taken by the selection boundary. If it is not enabled, the node will be shown connected to the previous node by a straight line while you are dragging it around, and you won't see the resulting path until you release the pointer button. On slow systems, if your control nodes are far apart, this may give a bit of a speed-up.